"The creatures of lore and legend - of myth and mystery - only the dragons know the answers to the secrets and ciphers that surround them. But brave adventuring souls who have gone before have left behind clues and epistles with valuable information for anyone in pursuit of dragons. This tome is a compilation of the lifetime efforts of numerous dragon-hunting adventurers, presented to those who crave hints and leads for dragon-questing." "They are the favorite foes of many a party of adventurers. 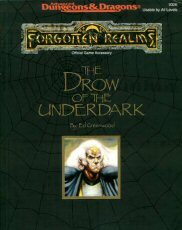 In these pages, the drow come to life, their culture and powers detailed fully for the first time. This guide presents new rules galore: new spells, new magical items, insight into the mysteries of Lolth, Monstrous Compendium entries for related monsters of the Underdark - and much, much more." "Drow. The Dark Elves, Those Who Have Turned to Evil. In elven tongues, they are referred to by several names: "tirl aukhbhet-ess," "tuer lothnil," and "duiss aszbhar." All of these translate to "The Accursed." The elegant, dark and deadly drow are a hated and feared race. In the dangerous caverns of the Underdark dwell many horrible monsters, including the drow. Obsidian-skinned kin to elves, this fell race has won mastery of magic — and a cruel reputation. Small children of Faerun hear whispered tales even before they are officially warned of Those Below. Pirates of the Fallen Stars reveals for the first time the details about the Pirate Isles, in the center of the Inner Sea. 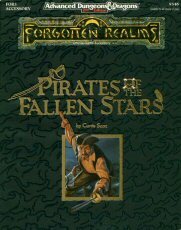 Here are facts about their societies, their interactions with the Inner Sea nations, their pirate kings, their ships, their style of combat; in fact, here is everything any DM or player needs to know to enjoy a campaign in the Sea of Fallen Stars and its environs." 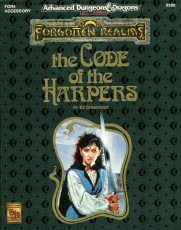 "From the storm-lashed rocks west of fabled Evermeet to the Plains of Purple Dust, all the folk of Faerun have heard of the Harpers. Noble fools, some call them. Crazy, misguided meddlers, others say. Still others disagree. "The one true hope of the Realms," said one princess. "A shining light in the darkness of out lives," agreed a sage, "pray that it never goes out." Just who are these mysterious, wandering folk who wear silver harp pins and walk softly in the most dangerous shadows of the Realms? Harper Haunts: their strongholds, and the Harpers who (literally) haunt them! ...And more, from favorite Harper ballads to detailed Harper NPCs. This is a sourcebook you'll turn to again and again. 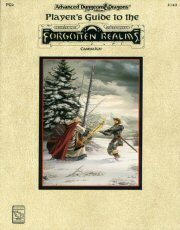 It lays bare the warring power groups who work behind the scenes in Faerun; no FORGOTTEN REALMS campaign is complete without it!" "For many years, Evermeet has remained a mystery, known only as the elves' place of refuge. So far, details about the island itself, its geography, rulers, and society have been sketchy. It is known that Evermeet is protected by illusory magic, that ships lose their way or vanish mysteriously if they approach the isle, and that the elven navy is the finest in the realms. Past publications have also revealed that Evermeet is ruled by Queen Amlaruil, and that her husband Zaor was murdered decades ago. Beyond this, little is known. 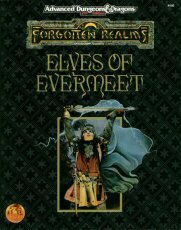 The Elves of Evermeet attempts to investigate and explain the inner workings of the elven island, and develop the realm as a setting for FORGOTTEN REALMS adventures. Until now, Evermeet has been reserved exclusively for the elves and officially closed to humans, dwarves, and other races. But this product will help you work Evermeet into your campaign and allow other PC races to visit, or at least interact, with the mysterious island. • adventure ideas for your own campaign!" Alustriel, Dove Falconhand, Laeral Silverhand, The Simbul, Storm Silverhand, Syluné, and Qilué Veladorn. 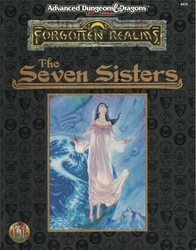 "Beautiful, powerful, mysterious, and deadly - the silver-haired Seven Sisters are legendary throughout the Forgotten Realms. One rules the city of bards, Silverymoon. Another is Elminster's beloved and the infamous Witch-Queen of Aglarond. The third is the Lady Mage of Waterdeep, peer and consort of Khelben "Blackstaff" Arunsun, and the fourth is a Harper and one of the famous Knights of Myth Drannor. The fifth is a leader of the Harpers and a legendary bard in her own right, and the sixth is a dead - perhaps undead - witch. And the seventh? She's the one who wild tales are whispered about all across Faerûn around many a fireside late at night. But who are they, really? Their very names conjure up romance, allure, and power - Storm Silverhand, the Simbul, High Lady Alustriel. Sages say they are among the Chosen of Mystara, archmages who wield magic few can dare to stand against. Yet these seven do not seek to rule the world, and they often stay quiet and hidden for generations. 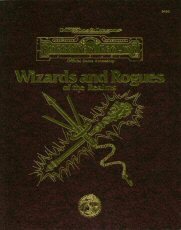 Read this tome, and learn what the Zhentarim, the Red Wizards of Thay, and the Cult of the Dragon could not, despite performing many fell deeds in the attempt. Learn the stories of these great ladies, and their aims and strivings - and browse among over a hundred new and spectacular spells! Dungeon Masters and players alike will find this volume an essential sourcebook of Realmslore, and a handy guide to archsorceresses peerless in power." "As Kiruna reached the mouth of the cavern, she realized the heat was emanating from two towering braziers, one on either side of the entrance. Deep gouges — now she could see they were runes, of ancient origin — ringed their bases and rims, their lines and curves carved by instruments far larger than any she could wield. Enter the world of Faerûn's giants as first revealed in Troy Denning's "Twilight Giants" trilogy of novels. Giantcraft presents game material based on those characters and events, including statistics for Princess Brianna, Tavis Burdun, and others; a section on player-character giants and giant-kin; a chapter on giant religion; a new magic-using class, the runecaster; details on giant rune magic; and detailed lairs for the main giant types found in the Ice Spires and their environs. Read about levendhule, the forbidden "living cave"; uncover the secrets of the Ordning; learn the history of the sons and daughters of Annam. Dungeon Masters and players alike are certain to find invaluable information in this latest Realms sourcebook. (Familiarity with the novels is not necessary to use this accessory.)" • New spells from mages such as Daltim, Darsson, and Myrl. • Fell creatures - the Tome Guardian, the Disenchanter, and the Scalamagdrion. • Details of more than 40 spellbooks - appearance, history, the magic they contain, and what is known of the fates of their makers. • And just for fun - Elminster's very own traveling spellbook!" "From Waterdeep to Thay, from the great Glacier to Calimshan, wizards and rogues dress, think, and behave in ways that tell the learned observer just where they hail from. Sometimes the differences are obvious—anyone can distinguish a seafaring mage from a turban-crowned spellcaster, or a thief of Lantan from a burglar of Amn. But often, appearance gives no clue: even wizards and rogues of the Dalelands vary from. Dale to Dale, though one may look the same as another. Faerftnians are fiercely proud of their heritage, and they carry their native traits with them wherever they go. 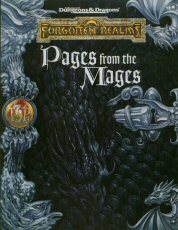 Within these pages are dozens of kits designed to help players in a Forgotten Realms® campaign discover their characters' roots and reflect them in role-playing. Special benefits and disadvantages related to each particular home town or territory allow players to create unique kits that can be applied to mages, specialist wizards, and rogues, and they can even be layered over other kits. As a bonus, two new player character subclasses have been included: the intriguing spellsinger and the stealthy shadow walker." "Fighters and clerics have long been mainstays in many AD&D game campaigns. Now, take a look inside this book and discover the dozens of kits created to adapt these basic classes to the unique and popular lands of Faerûn. Learn what a difference your homeland makes when you choose a warrior's kit, or discover the benefits as well as disadvantages of worshiping certain gods of the Realms. Some differences among people are subtle, while others can be quite glaring. This tome reveals ways to identify whether a mercenary hails from Chondath or Waterdeep. It tells you that not all black-clad priests are evil followers of Cyric, and even priests of the demipowers have skills to respect. 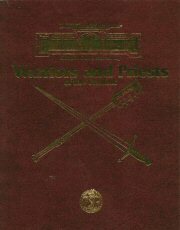 In addition to priest and warrior kits, unique PC subclasses are revealed herein: the Harper, roving guardian of nature and justice, and the Crusader, a militant priest able to defend the faith with steel if necessary. As sure as Elminster's pipe glows green, the true warriors and priests of the Realms stand revealed at last!" "No longer can the members of the most infamous clandestine organizations in all the Realms lurk in their comfortable shadows. No more can these men, women, dragons, dracoliches, and...others...scheme to subjugate all that is good and true while the rest of Faerûn waits unaware. For centuries has the evil secreet society founded by the mad mage and Chosen of Mystara, Sammaster, labored secretly - well, no more! This 128-page book lays bare the secrets of Sammaster and the secret society he created over 400 years ago. Herein is written the story of the Cult of the Dragon, beginning with its foundation based on an obscure line in a tome of ancient prophecy. Learn of the Cult's most powerful current cells, their leaders, the dragons and dracoliches that work with them (or for them), and their goals. Discover the many foes the Cult has earned in over four centuries of treachery and industrious malevolent dealings. Also included are the details of some of the spells and magical items of the Cult and its dragons and dracoliches, including the one item that no Cult member will ever admit the existence of, much less claim to possess. Read about the many magical variant and hybrid creatures that the Cult uses to excercise its will across the face of Faerûn. 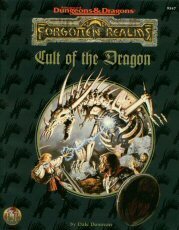 And finally, decide the best way to incorporate the Cult into a FORGOTTEN REALMS campaign by browsing the numerous adventure hooks for just the right scenario to tempt and terrify players of any gaming style." "Is your FORGOTTEN REALMS character an elf? A dwarf? Maybe a gnome? Perhaps, yet that doesn't really say much, does it? One might just as easily say there's no difference between a Calishite and a Thayan because they're both humans! No one is just a demihuman in the Realms - there are acrobats, barbarians, giant killers, manhunters, pestkillers, prospectors, and even tunnelrats, but they're all demihumans and they all walk the face of Faerûn. 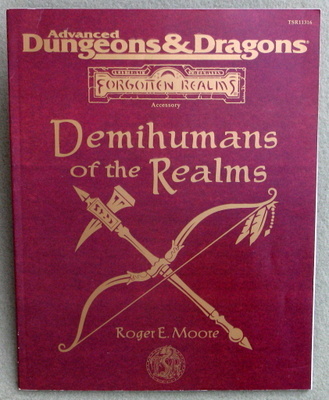 Within these pages are dozens of kits designed to help players in a FORGOTTEN REALMS campaign enrich their characters and make them truly native to the Realms. Special benefits and disadvantages for each kit enhance roots and racial heritages. 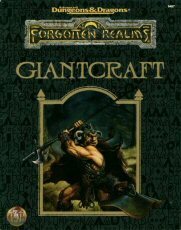 This companion to Wizards and Rogues of the Realms and Warriors and Priests of the Realms completes the series of kit-based sourcebooks for the FORGOTTEN REALMS campaign." 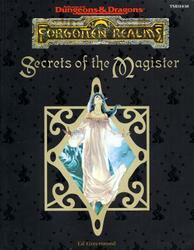 "The Magister of Mystara is one of the most mysterious - and misunderstood - beings in the FORGOTTEN REALMS setting. Some say the Magister is simply the most powerful mortal mage in all of Toril. Perhaps, but there is something more, something unique, about being so touched by the Mother of All Magic. The mages of Faerûn roll up their sleeves and craft spells and items that they hope will empower them to win the office of the Magister. A few will succeed. More will wish they'd never taken up magic in the first place. Here at last, one can learn all the secrets, abilities, and sacred duties of the Magister. Plus, discover the fate of Lady Nouméa and the identity of her successor as Magister. Also, read guidelines on how a PC mage might become the Magister. This book holds the history of the office, new powers, spells, magic items, a roster of select Magisters from the past, and guidelines on how to incorporate the Magister into your campaign." "Between Cormyr and the Moonsea lie the beautiful forests and fields of the Dalelands, home to some of the most powerful characters and exciting adventures in the Heartlands. Proud and free, these scattered realms stand against the dark evil of Zhentil Keep and the savage raiders of the mountains and forests. Ancient magic lies buried in dangerous ruins within the vast Elven Woods, waiting for the hand bold enough to seize it. The Dalelands are a place where adventurers are welcomed, and heroes rewarded with gold, honor, and power. Enemies, old and new, move against the Dales constantly, and the call goes out for brave and true heroes to defend the land! 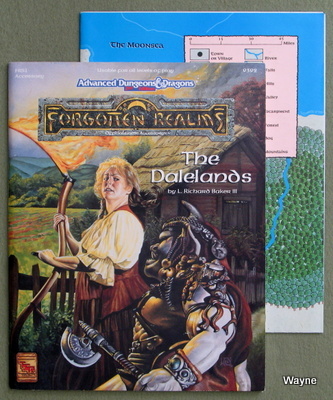 The Dalelands are the oldest campaign setting of the Forgotten Realms, finally described in detail. New and exciting information about each of these independent lands is contained in this accessory. Of course, the dark and sinister enemies who plot against the Dales are described as well! Prepare to meet the challenges of the Dalelands!" "There are many parallel worlds, and in times past, travel was easy between them. But those ways are now lost. Those worlds are forgotten. Welcome to the Forgotten Realms. This volume, brimming with newly rediscovered facts and original fiction, introduces you to the best-selling world of Faerûn, where elves are mysteriously disappearing, and magic is an art gifted by a goddess. No difficult game jargon obscures the wonders before you. Come and explore. Open this book, and discover a forgotten world!" This is one of the first books to mention the creator races and the Nether Scrolls. The "Mummies" chapter pits the characters against a greater mummy of one of the creator races, with a chance to walk away with one of the legendary Nether Scrolls. "The Undead. Denied the eternal rest of Death, cursed to wander the many planes and worlds forever, their very existence a mockery of the life they constantly crave yet cannot have. Created by the foulest magics, they have only one thought, one burning goal: revenge against the living. Or do they? 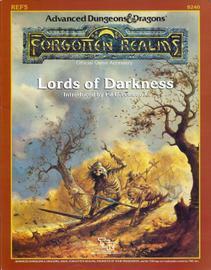 Lords of Darkness is an anthology of short adventures set in various locations in the Forgotten Realms, though you don't need the FORGOTTEN REALMS campaign supplement to use them. 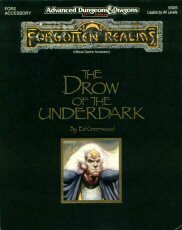 Some of gaming's best designers have contributed adventures to this collection, which feature undead of all types and descriptions in all sorts of situations - from skeletons to vampires and worse, from graveyards to haunted houses, and even a few places you may never have expected to find the undead. 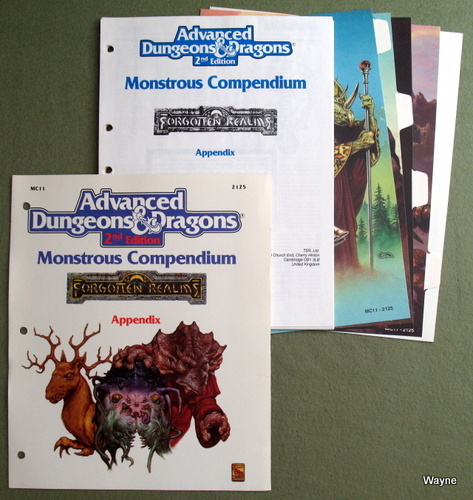 These adventures can be used one at a time, inserted into an existing campaign as a change of pace, or they can be a basis for an entirely new campaign. Either way, Lords of Darkness will be sure to give AD&D game players plenty of chills and excitement." NOTE: THE FOLLOWING PLAY EXAMPLES ARE FOR REFEREE'S EYES ONLY. THERE ARE SPOILERS HERE FOR PLAYERS. "Lords of Darkness" breathes new life (unlife?) into common villains of AD&D games: Undead. In addition to numerous essays front and back detailing suggestions for reffing the unliving, numerous short scenarios fill the center. Each scenario spotlights a particular undead type, for all levels of play. (8/24/03) I just finished running my players through the "Vampires" scenario, and it was hair-raising for them. They were under the mistaken assumption that they were in pursuit of one vampire. In fact, they were drawn into an ambush, assaulted by two vampires and lesser minions. Two in the party died quickly, but the PC's regrouped and triumphed. And this was only one of the scenarios. Others, like "Zombies," "Ghouls," "Mummies," etc. appear equally challenging and innovative. The essays are full of fresh ideas (including how to ref your way around the level drain of some of the undead). (1/1/04) As a New Year's Eve event, I dusted off REF5 once again. This time the characters were farther along in the campaign, and significantly stronger. An earlier adventure left a treasure map in the hands of the PCs; this map led to the Lair of Alokkair the lich. The players (My daughter & brother) were a little edgy, for liches are quite powerful. But their party ('The Menagerie Company') numbered nine and was well-balanced, even including a flesh golem. The beginning of the adventure was deceptively easy (stirges, ghouls), with a few traps. But Alokkair's Lair really doesn't begin until halfway through: A deep chasm filled with animated stones and boulders colliding with the walls, ceiling, and one another. The party must cross 40 feet from one ledge to another, and it is a lethal 40 feet. The party decided to pass a pair of Winged Boots back and forth, by pulling them back with a rope. Simply tossing them back bore a heavy risk of them of hitting a flying rock and plummeting to the depths below. One-by-one they crossed, pummeled by rocks of varying sizes. Gargoyles tried stealing the boots every time. Battered, the party entered the first chamber and attempted to rest. Alokkair harassed them relentlessly, depriving them of much needed rest and spell memorization. I'll have to hand it to the players... they were persistent. It took a stone golem, and two illusions of stone golems to get them moving. Their big break came when they destroyed a one-way secret door with a Stone Shape spell and gained access to the network of passageways used by the lich to spy on intruders. They bypassed several dangerous rooms, and made their way to the heart of the Lair. The characters easily dispatched Alokkair's weak minions along the way. The lich, alarmed by a still-vital party on the way -- and out of servitors -- left the gift of a Delayed Blast Fireball and fled. His two daughters -- ju-ju zombies -- attempted to flee as well with Alokkair's spell book. The party ran them down just in time. 1. His spells, while powerful, have overlong casting times. He'd probably get a few off before the party's fighters closed and destroyed him. He'll locate new spells to adapt to this threat. 2. He over-relied on unintelligent, programmed undead who couldn't respond to unanticipated events. This, too, will not happen again. The party has not seen the last of Alokkair. 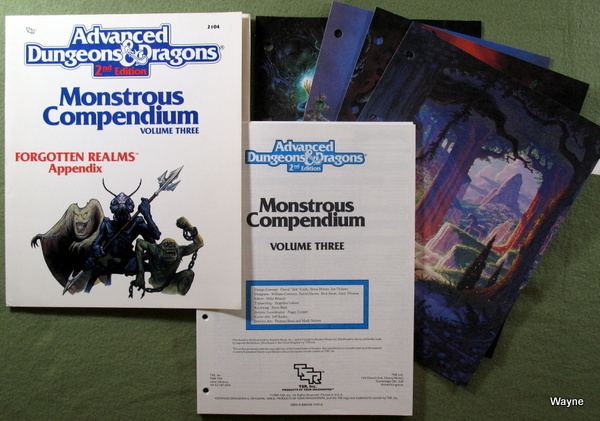 "More monsters escape from the Realms and into your AD&D 2nd Edition game! Sixty-four pages chock-full of new monsters for use in your own campaigns and with the FORGOTTEN REALMS Campaign Setting. From the gnomish svirfneblin to the deadly dracolich; from the wemic to the revenant; they're all here! Battle the beholder-kin of the North, the dinosaurs of the Jungles of Chult, and the oriental dragons of Kara-Tur. All these creatures and more are organized in 64 5-hole punched pages that will make a handy appendix to your Volume One Monstrous Compendium binder. Add them in and turn them loose on your players!" CREATURES: Ascallion; Asperii; Beholder-kin; Belabra (Tangler); Berbalang; Bhaergala; Bichir (Lungfish, Giant); Bunyip; Burbur; Claw, Crawling; Cloaker; Darkenbeast; Death, Crimson; Dinosaurs; Dracolich; Dragon, Faerie; Dragons, Oriental; Firenewt; Firestar; Maedar; Meazel; Pleistocene Animals; Revenant; Rhaumbusun; Strider, Giant; Sull; Svirfneblin (Deep Gnome); Thessalmonster; Thri-kreen (Mantis Warrior); Thylacine; Vulture; Vurgens; Web, Living; Wemic. CREATURES: Alaghi; Alguduir; Avian; Bat, Deep; Beguiler; Cantobele; Cat; Chitine; Cildabrin; Dimensional Warper; Dragon, Deep; Elf, Aquatic; Fachan; Feyr; Firetail; Frost; Gaund; Giant, Mountain; Gloomwing; Golden Ammonite; Golem, Lightning; Hamadryad; Harrier; Harrla; Haun; Haundar; Hendar; Inquisitor; Lhiannan Shee; Loxo; Manni; Mara; Morin; Naga, Dark; Orpsu; Peryton; Phantom; Plant, Carnivorous; Ringworm; Rohch; Sandcat; Saurial; Shaaz; Silverdog; Simpathetic; Skuz; Spider, Monkey; Tempest; Tlincalli; Tren.